From the Deadpool collection by Entertainment Earth. Deadpool Chair Cape. From the Deadpool collection by Entertainment Earth. 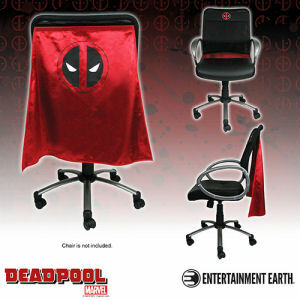 Deadpool Chair Cape. Chair Cape is 24 inches long and 30 inches wide. It includes an adjustable hook and loop based belt and strap that will fit most size chairs. Machine washable in cold water hang to dry and the strap is spot clean only. Chair is not included. Entertainment Earth Deadpool Stationery shipping from Canada. No Surprise Border fees or Customs!